Aakif U Khan, Hameedullah, Abdul Saeed Shah, Muhammad Rauf Khattak. Radiosynoviorthesis (RSO) is an attractive alternative to surgical synovectomy for controlling symptoms of rheumatoid arthritis and many other chronic proliferative joint diseases. The procedure is not widely used in our country because of the non-availability of suitable radionuclides and radiopharmaceuticals. The production of rhenium-188 (<sup>188</sup>Re) from <sup>188</sup>W/<sup>188</sup>Re generator and by labelling it with particles of appropriate size, has a promise to offer. We labelled 188Re with tin colloid and analyzed its biodistribution and clinical efficacy after injecting it to a patient with recurrent pigmented villonodular synovitis. Gamma camera imaging performed after 1, 24 and 48 hrs showed no leakage of the radiopharmaceutical from the injected joint. The clinical outcome of this study was also excellent, which suggests that <sup>188</sup>Re labelled tin colloid is a potentially effective radiopharmaceutical for recurrent PVNS and can be used for other chronic inflammatory joint diseases. Aakif U Khan, Hameedullah, Abdul Saeed Shah, Muhammad Rauf Khattak. Radiosynoviorthesis in pigmented villonodular synovitis using Re-188 labelled tin colloid: a case report. Pak J Nucl Med. 2016; 6(1): 42-47. Aakif U Khan, Hameedullah, Abdul Saeed Shah, Muhammad Rauf Khattak. Radiosynoviorthesis in pigmented villonodular synovitis using Re-188 labelled tin colloid: a case report. http://www.pjnmed.com/?mno=284586 [Access: April 22, 2019]. Aakif U Khan, Hameedullah, Abdul Saeed Shah, Muhammad Rauf Khattak. Radiosynoviorthesis in pigmented villonodular synovitis using Re-188 labelled tin colloid: a case report. Pak J Nucl Med. (2016), [cited April 22, 2019]; 6(1): 42-47. Aakif U Khan, Hameedullah, Abdul Saeed Shah, Muhammad Rauf Khattak (2016) Radiosynoviorthesis in pigmented villonodular synovitis using Re-188 labelled tin colloid: a case report. Pak J Nucl Med, 6 (1), 42-47. Aakif U Khan, Hameedullah, Abdul Saeed Shah, Muhammad Rauf Khattak. 2016. Radiosynoviorthesis in pigmented villonodular synovitis using Re-188 labelled tin colloid: a case report. Pakistan Journal of Nuclear Medicine, 6 (1), 42-47. Aakif U Khan, Hameedullah, Abdul Saeed Shah, Muhammad Rauf Khattak. "Radiosynoviorthesis in pigmented villonodular synovitis using Re-188 labelled tin colloid: a case report." Pakistan Journal of Nuclear Medicine 6 (2016), 42-47. Aakif U Khan, Hameedullah, Abdul Saeed Shah, Muhammad Rauf Khattak. "Radiosynoviorthesis in pigmented villonodular synovitis using Re-188 labelled tin colloid: a case report." 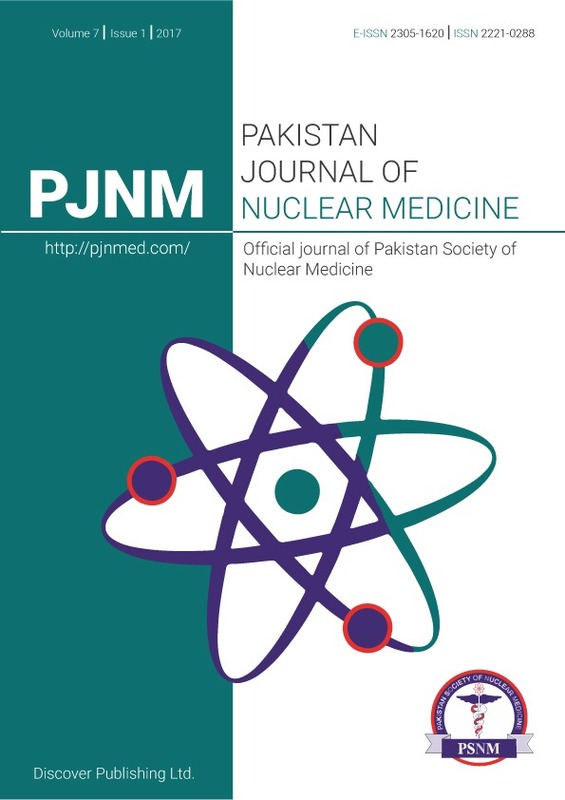 Pakistan Journal of Nuclear Medicine 6.1 (2016), 42-47. Print. Aakif U Khan, Hameedullah, Abdul Saeed Shah, Muhammad Rauf Khattak (2016) Radiosynoviorthesis in pigmented villonodular synovitis using Re-188 labelled tin colloid: a case report. Pakistan Journal of Nuclear Medicine, 6 (1), 42-47.